A small contingent of Chelsea & Fulham H.O.G. took the journey under the Channel early in September on five Harleys, the sun was shining on the righteous, hot, no it was more than hot, it was scorching! Some considered it an early start but personally a 09.50 tunnel is a positive lay in for me so we didn’t ‘land’ en France until nearly 11.30am local time. With this in mind it was a quick blast to Arras for lunch where a chirpy English speaking restaurant owner helped us decipher the very French menu. The only problem as such was that as most of us were riding it was a very sober alcohol free bite to eat. Lunch done we moved off to Reims our base for the next couple of nights, bikes parked and unloaded we headed out for a few beers and most settled for a Belgian beer, Affligem which was a little potent. BUT we only had a few, honest, then we went for dinner at out ‘local’, Le Grande Café. As we were in Champagne it was rude not to try some bubbles, wasn’t it? I mean I asked what folk wanted to start with and all decided on the fizzy stuff, fair enough as it keeps Jane happy. Midnight in September and sat outside having dinner and chewing the fat, top stuff! 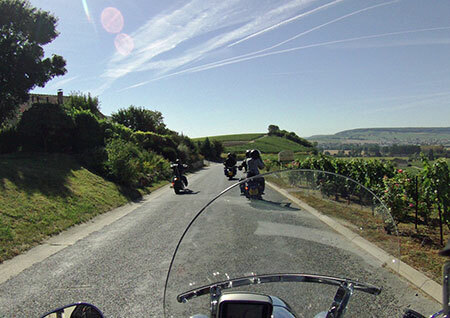 Saturday morning came around a little too soon and the group decided on a ride-out to see champagne vineyards, the abbey of Saint-Pierre in Hautvillers where Dom Perignon ‘created’ champagne. Lunch came too soon so we dropped the ladies off back at base for some ‘shopping’ and pool time but first we all paid a visit to Notre Dame, the ornate cathedral where the kings of France were crowned. After that the ‘boys’ ventured out to the local HD dealership so that Keith Jones could upgrade his ABC points program. Then we headed out of town on the ‘long way round’ to find the lighthouse in Verzenay which was built as a platform to advertise champagne. A quicker ride back into town and then a ‘Lobster run’ style dinner based on mostly shell fish in the hotel restaurant. I have to say I was a little jealous of the main course seafood platter chosen by Gary France, some more champagne and all too soon it was Sunday and time to think about returning to the UK. With a 17.20 tunnel booked we took a gentle ride through the countryside on near deserted Sunday roads before stopping for a small lunch break in Saint Quentin which consisted of a large Croque-monsiuer. The afternoon was hot, proper hot as we carried on towards Arras - several times we stopped to ‘moan’ about the heat and take on ice creams and drinks - and all this in September! Soon we were back at Calais and loaded into the train returning to England and when the doors opened it was noticeably cooler. Who knows perhaps we might have a Champagne and Burgundy tour next year? 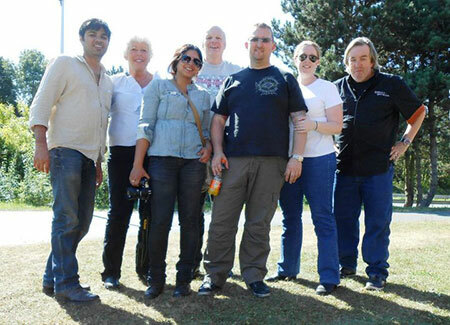 There is a further write up by Gary France on his website blog featuring motorcycle tales.